HCL Technologies Company Career Recruitment Job Opening 2018-2019, Recruitment Executive Job Posts Registration Link Download at www.hcl.com, HCL has Recently announced an official advertisement for Recruitment Executive Posts Interested and Eligible Candidates can Download Application Through Official website. 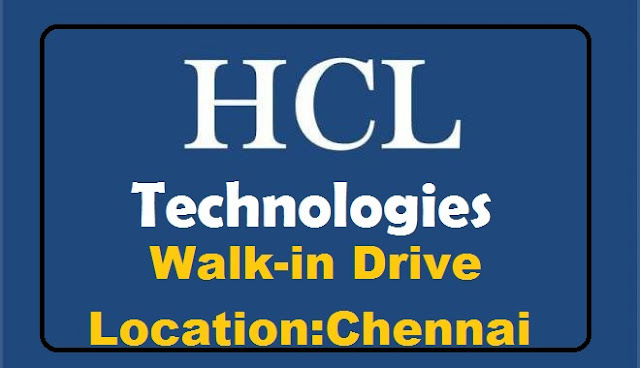 HCL Walk-in Drive Recruitment Executive Post @ Chennai - Apply Now. Handling end to end recruitment in ITES / BPO - BFSI / Investment Banking. Experience in Volume Hiring/ Bulk Hiring/ Mass Hiring/ Front Line Hiring. Screening, Shortlisting, Interview coordination, Vendor Management, Stakeholder Management, Salary Negotiation, Background Verification and Onboarding. Experience in Hiring & Onboarding activities. Determine job requisition information, sourcing strategy and screening questions. Hands on experience in Sourcing (Mandatory) through Job portals. Headhunting, Social Media and managing Employee Referrals. Experience in to BPO / ITES recruitment mandatory. Experience in frontline Hiring for Back office BFSI / Investment Banking domain is an added advantage. Compile and provide selected candidate with appropriate paperwork (including benefits information) necessary to complete the on-boarding process, and perform any associated data entry for payroll and benefits. Post position in accordance with agreed upon client sourcing strategy, policy and local regulatory/legal/privacy requirements. Ability to handle end to end recruitment. Excellent command in verbal and written English.